LeanPath has won a MRW National Recycling Award in the category of efficiency. 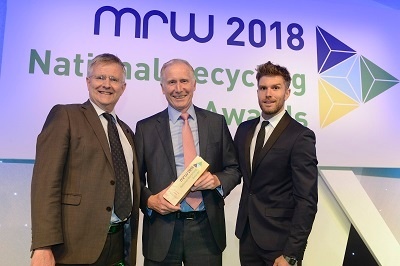 The UK-based awards program aims to recognize and celebrate best practice and innovation in recycling and waste management. Judges said that LeanPath "tackles one of the most difficult categories of waste in a sector which is a tough space to operate in. It can be rolled out to more organisations and has shown how it can drive large scale efficiencies." "This award recognizes the substantial efficiency gains that LeanPath brings to global kitchens," said LeanPath VP of Food Waste Prevention Steven Finn. "By consistently tracking all food waste transactions with our suite of innovative tools, we empower culinary organizations to measure and analyze their food waste, and then make the necessary operational changes to prevent its recurrence in the future. These efficiency gains result in triple bottom line impact -- allowing responsible organizations to save money, reduce environmental harm, and inspire their people while helping to build a more sustainable food system." Above: Paul Bracegirdle, LeanPath Senior Account Manager, Accepting Efficiency Award at UK National Recycling Awards.